San Diego Citizenship and Naturalization Lawyer by Habib Hasbini, Attorney at Law. Step 1. Determine if you are already a U.S. citizen. If you are not a U.S. citizen by birth, or you did not acquire or derive U.S. citizenship from your parent(s) automatically after birth, go to the next step. Determine if you are eligible to become a U.S. citizen. Review the naturalization eligibility worksheet to help you decide if you are eligible to apply for naturalization. Step 3. Prepare your Form N-400, Application for Naturalization. Download the form and read the instructions. Get 2 passport-style photos and collect the necessary documents to demonstrate your eligibility for naturalization. Use the document checklist to make sure you collect all the required documents. Step 4. Submit your Form N-400, Application for Naturalization. Once you submit Form N-400, USCIS will send you a receipt notice. You can check current processing times and the status of your application online or by calling the National Customer Service Center at 1-800-375-5283 or 1-800-767-1833 (hearing impaired). Step 5. Go to the biometrics appointment, if applicable. If you need to take biometrics, USCIS will send you an appointment notice that includes your biometrics appointment date, time, and location. Arrive at the designated location at the scheduled time. Have your biometrics taken. Step 6. Complete the interview. Step 7. 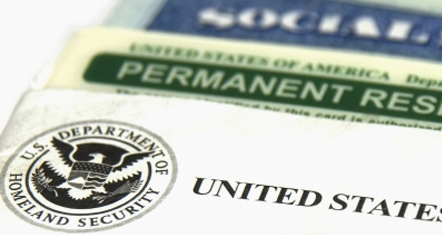 Receive a decision from USCIS on your Form N-400, Application for Naturalization. USCIS will issue you a written notice of decision. -Granted-USCIS may approve your Form N-400 if the evidence in your record establishes that you are eligible for naturalization. -Continued-USCIS may continue your application if you need to provide additional evidence/documentation, fail to provide USCIS the correct documents, or fail the English and/or civics test the first time. -Denied-USCIS will deny your Form N-400 if the evidence in your record establishes you are not eligible for naturalization. Step 8. Receive a notice to take the Oath of Allegiance. If USCIS approved your Form N-400 in step 7, you may be able to participate in a naturalization ceremony on the same day as your interview. If a same day naturalization ceremony is unavailable, USCIS will mail you a notification with the date, time, and location of your scheduled ceremony. Step 9. Take the Oath of Allegiance to the United States. Complete the questionnaire on Form N-445, Notice of Naturalization Oath Ceremony. Report for your naturalization ceremony and check in with USCIS. A USCIS officer will review your responses to Form N-445. Turn in your Permanent Resident Card (Green Card). Take the Oath of Allegiance to become a U.S. citizen. Receive your Certificate of Naturalization, review it, and notify USCIS of any errors you see on your certificate before leaving the ceremony site. Step 10. Understanding U.S. citizenship. Citizenship is the common thread that connects all Americans. Check out the list of some of the most important rights and responsibilities that all citizens-both Americans by birth and by choice-should exercise, honor, and respect. ImmigrationLawyer-SanDiego.com provides individuals seeking to naturalize with a naturalization lawyer that takes the worry out of the process. Everyone knows that naturalization has many benefits. However, if inappropriately filed, or incorrectly filed, a naturalization petition can lead to a denial and even deportation from the United States. ImmigrationLawyer-SanDiego.com seeks to take that worry out of the naturalization process, and make the process as smooth and hassle-free as possible. ImmigrationLawyer-SanDiego.com is provided as a service to the naturalization clients of Law Offices of Hasbini Immigration Lawyer San Diego, a full service immigration law firm that provides representation to clients throughout the United States and the world. Why Law Offices of Hasbini Immigration Lawyer San Diego? Becoming a U.S. citizen is why many immigrants come to the United States. The firm realizes that this last step should be approached with the same care and diligence that an immigrant has taken on all the previous immigration steps. The firm strives to provide immediate, personal assistance to all of its clients and works to ensure that all client questions are answered by a naturalization attorney. The firm also works proactively to ensure that no individual unknowingly risks being removed from the country while attempting to naturalize. We can handle any type immigration problems. Our firm is dedicated to helping individuals with immigration matters when they are visiting the US, and assisting them before the Asylum Office. Law Offices of Habib Hasbini Immigration Lawyer San Diego is dedicated to winning the toughest immigration cases. Your case must be carefully evaluated to determine the best legal strategy to assist you and your family . Our offices serve immigrants from all over California, the United States, and around the world in most kinds of immigration defense matters. We are here to help you quickly solve your immigration problems, so you and your family can finally build a future here in the United States.